The Quality Adirondack features reclaimed wood pattern on its exterior, and is lined with kiln-dried Spanish cedar. 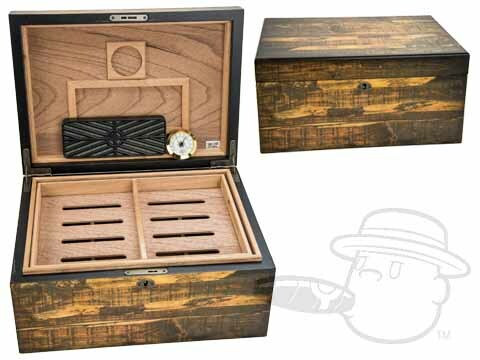 Each one features a humidification unit, hygrometer, antique-style lock and key, Spanish cedar tray with divider, and two Spanish cedar dividers for the bottom of the humidor. And as with all Quality humidors, the Adirondack features SureSeal® technology, so you can be sure your cigars are always aging perfectly. Adirondack 100 Count Humidor is rated 4.9 out of 5 based on 2 customer ratings.